Microsoft Azure is an open-source for client SDKs, cloud computing service for building, testing, deploying, and managing applications and services through a global network of Microsoft-managed data centers. Microsoft Azure is created and developed by Microsoft Corporation and the Initial release was 1 February 2010. Windows Azure was originally code named “Red Dog” and was initially called “Windows Cloud” when it first launched in October 2008. Windows Azure is designed to support both Microsoft and non-Microsoft platforms. What Are The Advantages and Disadvantages of Windows Azure? Microsoft Azure is public cloud computing platform and most of users using these services to develop and scale new applications, or run existing applications, in the public cloud. Azure Web Sites and O365 serve as a SaaS offering. Why do People use Azure? Microsoft Azure has leveraged and it’s constantly expanding worldwide network of data centers to create Azure, a cloud platform for building, deploying, and managing services and applications, anywhere worldwide. What Are Azure Cloud Services? Azure Cloud Services is a classic Azure resource, originally introduced by Azure back in 2008. It uses to support scalable web and worker role applications running on Windows. What do you mean by Roles in Azure? Roles in cloud management are often termed to be nothing servers that are linked to managing and balancing the platform as service machine that collaborate works to attain the goal. 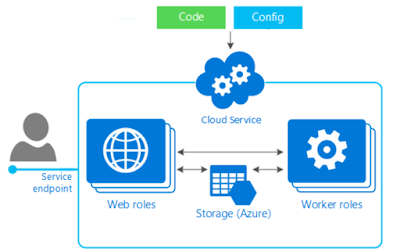 Web Role is a Cloud Service role in Azure that is configured and customized to run web applications developed on programming languages/technologies that are supported by Internet Information Services (IIS), such as ASP.NET, PHP, Windows Communication Foundation and Fast CGI. Web Role automatically deploys and hosts your app through IIS. Worker Role instance is also a VM instance just like a Web role instance and Worker role instance runs only windows server OS and is not loaded with IIS. Worker Role is any role in Azure that runs applications and services level tasks, which generally do not require IIS. In Worker Roles, IIS is not installed by default. Worker Roles are best suited for hosting backend processing and a wide variety of web services. A Worker role once started keeps running all the time just as a Windows Service. To keep it running, the worker role uses a simple while (true) loop. VM Role is a kind of role in the Azure platform which helps to maintain service packs, patches, updates and applications already installed, to Windows Azure automatically. The VM role is the newbie, and it uses a virtual hard disk (VHD) image of a Windows 2008 R2 server. The image is created internally on your network using Hyper-V technology and then uploaded to Windows Azure. This image can be customized and configured to run whatever software you would like to run in the cloud. VM Role in the cloud doesn’t seem like the best option for the long-term. They are provisioned in a similar way to Web Role and Worker Role. Whenever you specify you need a new instance of any of these roles, the “original” image is used. If you make modifications to the file system of one of these roles and then shut it down, those changes are not saved. Be aware that it is the VM Role instance type in Cloud Services that is being retired on May 31st 2013, not Windows Azure Virtual Machines. 1. Web roles are web applications hosted in IIS. 4. Actually, Web Roles and Worker Roles are VMs. Does the Azure VM Role Still Exist? Windows Azure VM Role is being completely retired or dead. What Is the Difference Between Web Role and Worker Role? The main difference between the two is that an instance of a web role runs IIS, while an instance of a worker role does not. Which Services Are Used to Manage the Resources in Azure? Azure resource manager is the infrastructure that is involved in to manage deploys or deleting all the resources. State the Purpose of the Cloud Configuration File? There is a primary “.csfg” file available with each and every cloud service. 1. They hold the main copy of certificates. 2. They have the storage of user-defined settings. 3. There are a number of instances in any service project. How Many Types of Deployment Models Are Used in Cloud? What Are the Difference between Private Cloud and Public cloud? What Are the Three Main Components of Windows Azure Platform? BLOB stands for “Binary Large Object”. Blob is file of any type and size. What Is SQL Azure Database? SQL Azure database helps in connecting to the cloud services where the database is stored for the organization on the cloud. It is also referred to as Microsoft SQL data services. What Are the Main Features of SQL Azure? Cspack is a command line tool which used to generate a service package file (.cspkg). Csrun is a command line tool which used to deploy a packaged application to the Windows Azure compute emulator and manages the running service. Guest Os is the operating system that runs on the virtual machine and hosts an instance of a role.